A newcomer to this year’s top 10 list, Constellation has 24 staterooms and can accommodate up to 48 guests. She charters the Mediterranean year-round and, like the rest of the yachts here so far, excludes expenses from her weekly rate. 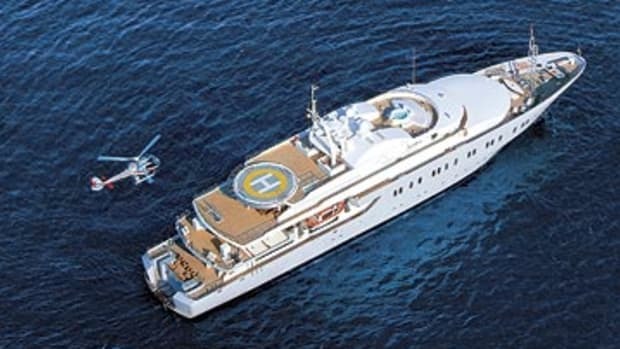 Whether she’s chartered by a large extended family or for a corporate getaway, her crew of 50 guarantees the highest level of personal service. Those lucky enough to be assigned to the owner’s suite, dubbed the Chairman’s Suite, will be pampered in an 840-square-foot space that includes a king-size bed, separate conference/media room, lounge with bar, walk-in wardrobe, and marble-lined, en suite head with Jacuzzi tub. Not everyone can stay in the master suite, but those who want to make an impression can arrive via helicopter and watch guests’ jaws drop when Constellation’s helipad rises hydraulically from her aft deck. For more fun, you can cruise aboard her pair of vintage Hacker-Craft tenders.